book your influencer campaign now. Reach up to one out of every ten new mums and mums-to-be in Australia. We are the trusted friend recommending your product to them all. Meet Australia’s most trusted mummy blogger. 226,000 Australian mums trust Tanya for hints, tips and product recommendations. Record results. We’ve turned no-name brands into household names, and delivered big numbers to national brands, consistently, for seven years. Get unparalleled access. 227,000 (growing daily) Australian mums actively rely on us for recommendations about your product. Reach one in ten* new families in Australia in one simple campaign. Trust is everything. As a qualified pharmacist and social media influencer with a 7 year track record of massive growth, you’re working with a trusted influencer, not a standard mummy blogger. Scaled campaign options. Tailored advertising packages for small business, large business and agencies. Let’s face it, working with mummy bloggers is a big risk. You need to know that your spend is going to strategically deliver real results. With seven years and hundreds of campaigns delivered, we can position your brand as the only choice for mum in Australia. You’ll work with a team of Australian digital professionals and receive full reporting on your campaign. With 227,000 new Australian mums relying on us for hints, tips and product recommendations, Baby Hints and Tips is Australia’s largest, highly targeted community for your audience. 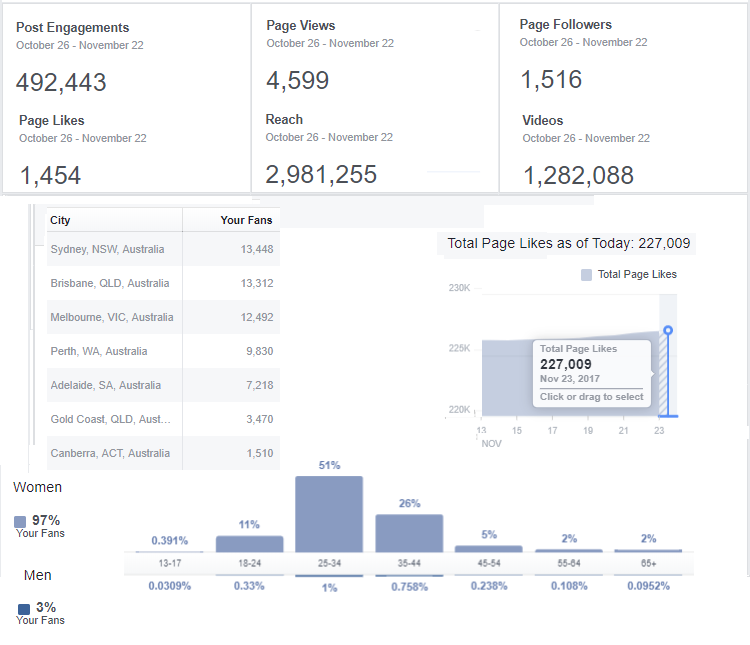 Our Facebook followership grows by hundreds (and sometimes thousands) each week because Aussie mums can’t get enough of our content. Our Facebook reach and engagement continues to outperform other mummy bloggers consistently. What does that mean to you? We know Australian mums. We know what they like. We know how to talk with them. For you, it means a warm and friendly introduction to your product by a trusted friend. There’s a lot of savvy mummy bloggers in Australia but few are backed by a team of digital marketing pros who stay on top of the latest best practices in social media marketing and SEO. Our team build content around your goals to ensure we deliver you results beyond the usual. Need email list building? Want more social followers? Need to add trust to your link profile with a no followed link from an aged, authoritative domain. Our influencer Tanya Burgess is not your typical mummy blogger. Tanya’s a qualified, experienced pharmacist who is the trusted voice in all things pregnancy, baby and toddler health and wellbeing. Tanya started Baby Hints and Tips in January 2010 and grew a large, supportive community of new mothers actively seeking advice and recommendations. For advertisers, this means that your product faces fewer “ad barriers” that other mummy blogger communities. Our audience is not only open to your brand, they’re waiting for it. Without trust there is no influence, and Tanya is Australia’s trusted source for all things baby. Let Tanya influencer her audience, on your behalf. 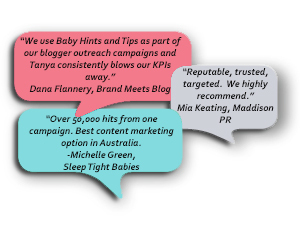 Baby Hints and Tips has worked with some of Australia’s biggest brands, and made household names of emerging baby brands. With tailored “Mummy Blogger” campaigns available, Baby Hints and Tips offers excellent results, scaled to your business budget. Talk to us now to find out what we can achieve, together. *Calculated on the number of families with pregnancies to children aged 3 in Australia in relation to our audience numbers.